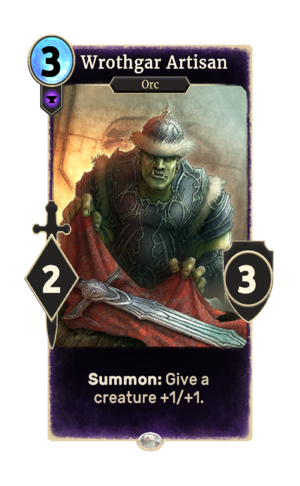 Wrothgar Artisan is a common Endurance creature card. It is part of the Core Set. "Try this on for size." This card's summon ability applies the Artisanal Weapon card effect. The card originally appeared in the gameplay overview video as a 2/3 card, but was changed to 2/2 in open beta. It was changed back to 2/3 in 11/2016 because the devs felt that Orcs needed a buff. This page was last modified on 15 February 2019, at 22:14.